When it comes to music, it always pays to have an open mind. 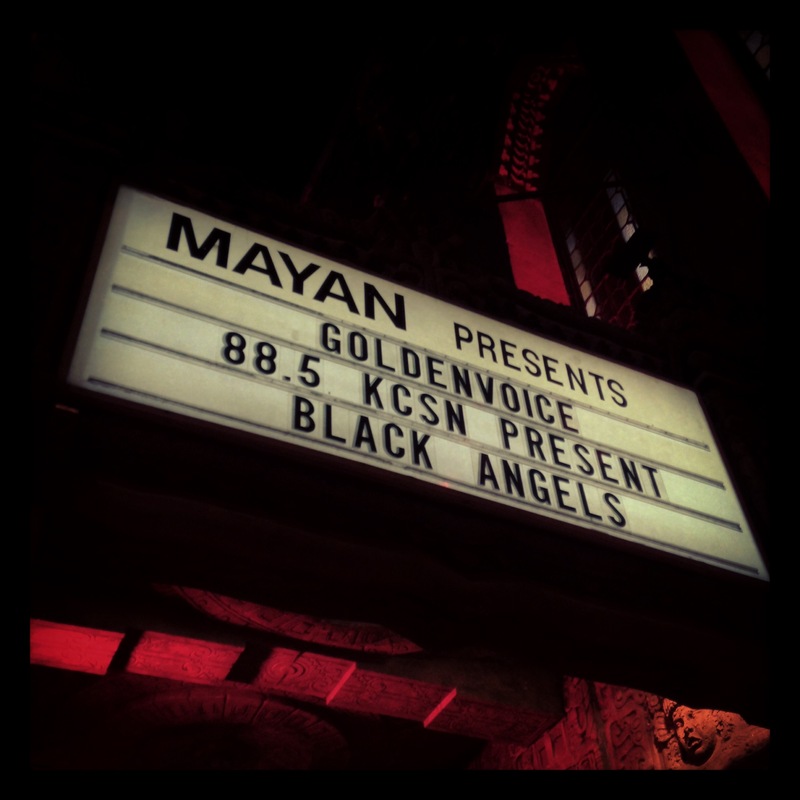 A friend of mine posted on Facebook that she had an extra ticket to see The Black Angels at the Mayan Theater. It was a weekday (which is typically a no-go for me due to my typical work load) but I’d always been interested in the Black Angels because of their reputation of being a good psychedelic rock band. Tthe ticket was free, and I had pulled an all-nighter earlier in the week… so I replied to the post, and the ticket was mine. My friend wanted to make sure we got to the venue in time to catch one of the opening acts, Hanni El Khatib . As we drove to the Mayan, she was telling me about Hanni, and mentioned that Dan Auerbach produced Hanni’s latest album. Whoa…. You mean the The Black Keys’ Dan Auerbach? Yup. I was intrigued. We got to the venue, and we decided to make our way as close to the stage for Hanni’s set. As soon as he took the stage, the crowd started a raucous cheer more fitting for a headliner than an opener. He started his set, and I could immediately feel the raw, garage rock essence of his music that probably drew Dan Auerbach to it. A few songs into the set, and the crowd started to bounce to the blues rhythms of the music. Sure, the music sounded very similar to the Black Keys, but you couldn’t deny his music ability and the way he was able to engage the crowd. The music was good enough, that I didn’t have to know any of the songs to enjoy the set, and that says something. During his set, I noticed that the merchandise table (which was oddly located close to the stage, stage left, on a separate, elevated space) was uninhabited, save but the merchants sitting at the tables. I made my way to the tables and found myself away from the crowd, in a space that was really all my own. If there was a VIP section, that would area have been it. LOL. After Hanni’s set had ended, I decided to purchase a couple LPs. Since I was a little short on cash, I opted to pick up his debut album “Will The Guns Come Out” and a limited edition 7’’ single, with a hand-screented cover, of “Skinny Little Girl/Pay No Mind”. My friend, and her friends, joined me at the merchandise table and after making our purchases, and lollygagging a bit, Hanni dropped by the table to say hello to his fans. Yup. 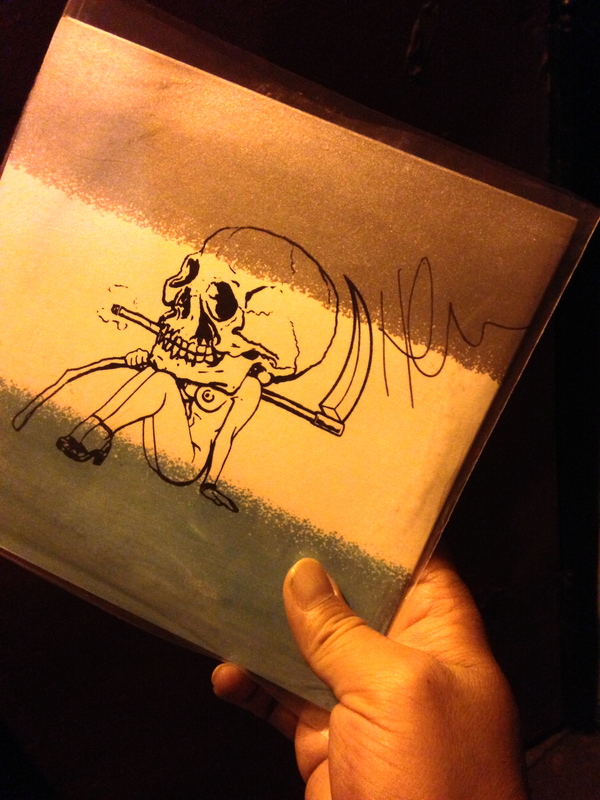 Me being the music dork, I got a picture and had him sign the 7’’ single … with a ball point pen (damn those bouncers for throwing away my permanent marker! Next time it goes in the shoe!) I asked him when he was planning on performing again in Los Angeles, and he told me that he was touring in Europe, and was looking to have gigs at the El Rey and on the Santa Monica Pier for the summer concert series. I am definitely going to check him out again. After such an exhilarating set from Hanni El Khatib, my expectations for The Black Angels was slightly mixed. Blues/garage rock followed by psychedelic rock? Seems like an odd mix, no? I followed my friend upstairs to the balcony seats when the Black Angels started their set. We waited in line at the upstairs bar for what seemed like forever to get a bottle of water (yup, I was the designated driver), and the band had already started when we found a spot to sit. The balcony at the Mayan is interesting in that it has a little “patio” area that seemed to serve as a mini dance floor. As soon as the Black Angels started their set, people immediately began to dance, swaying back and forth … dancing like those people I used to watch in those Woodstock documentaries. The music was good, but it honestly felt like a little bit of a let-down after Hanni El Khatib’s powerful set. I’m a huge fan of Grateful Dead, Jimi Hendrix, Cream, etc., but this music didn’t leave as big of an impression on me as I thought it would. Maybe I needed a few drinks or “something” to help me enjoy the music more. Again, it sounded good … it just didn’t hit the spot for me. I spent most of The Black Angels set people watching with my friends. We noticed a lot of tattoos. Hot chicks with tattoos. A lot of dancing bodies. A lot of dudes sitting around us with their eyes closed “twitching” around and bobbing their heads. People young and old. A diverse and amusing crowd. We left the venue as soon as the Black Angels started their encore, and though I hardly ever leave shows early, I didn’t feel like I was missing anything. The Black Angels were good, but if I wasn’t shrooming or on something, it was really just background music to me. The highlight of the evening for me was the music I wasn’t even expecting. If it wasn’t for my curiousity about The Black Angels, I would never have discovered the music of Hanni El Khatib.